Our daily lives, our culture and our politics are now shaped by the digital condition as large numbers of people involve themselves in contentious negotiations of meaning in ever more dimensions of life, from the trivial to the profound. They are making use of the capacities of complex communication infrastructures, currently dominated by social mass media such as Twitter and Facebook, on which they have come to depend. 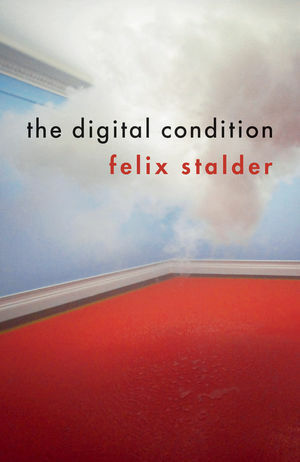 Amidst a confusing plurality, Felix Stalder argues that are three key constituents of this condition: the use of existing cultural materials for one's own production, the way in which new meaning is established as a collective endeavour, and the underlying role of algorithms and automated decision-making processes that reduce and give shape to massive volumes of data. These three characteristics define what Stalder calls 'the digital condition'. Stalder also examines the profound political implications of this new culture. We stand at a crossroads between post-democracy and the commons, a concentration of power among the few or a genuine widening of participation, with the digital condition offering the potential for starkly different outcomes. This ambitious and wide-ranging theory of our contemporary digital condition will be of great interest to students and scholars in media and communications, cultural studies, and social, political and cultural theory, as well as to a wider readership interested in the ways in which culture and politics are changing today. Felix Stalder is Professor of Digital Culture and Network Theory at the Zurich University of the Arts. "A remarkable map of the social and cultural changes brought about by the shift to digital culture. Broad in scope and precise in detail, this is a book of plentiful insights and deft propositions." "A fresh and intimate analysis that transcends labels and points to the tendency toward commons as proof for the existence of genuine, fundamental, and cutting-edge alternatives. Felix Stalder is whispering in the reader's ear that, yes, despite everything, another world is possible. A must-read for anyone who cares about the future."